Utes in review: Utah has jumped into a tie for second in Pac-12 basketball. Is that sustainable? The Utes will take a four-game winning streak into Thursday’s home game vs. Oregon. (AP Photo/Ben Margot) Utah's Timmy Allen (20) shoots between California's Matt Bradley (20) Justice Sueing (10) and Grant Anticevich in the second half of an NCAA college basketball game Saturday, Jan. 26, 2019, in Berkeley, Calif.
Berkeley, Calif. • When the new year began and Utah entered the Pac-12 season, ESPN’s Basketball Power Index projected a 6-12 conference record for the Utes. If they beat Oregon at home Thursday, the Utes will have six wins in January. Picked to finish eighth in the Pac-12, and having performed below that expectation in November and December, the Utes (11-8, 5-2) are tied with USC for second place in the conference. Utah is guaranteed to finish the first half of the league season with a winning record. The Utes' winning streak is a function of a favorable schedule, with victories over four teams — Washington State, Colorado, Stanford and California — that have a combined 6-24 conference record. Even so, there’s value in what the Utes have done, especially if they can follow through when the schedule becomes more difficult, as they return to the Huntsman Center this week. The analytics keep saying Utah is a middle-tier team, at best, in the Pac-12. The BPI now projects 9.3 wins for them in the 18-game conference schedule. So finishing in the Pac-12′s top four for a fifth-straight season is still asking a lot of this team, but the Utes have given themselves a chance to do so after the program’s first road sweep of Stanford (70-66) and Cal (82-64). Utah received contributions throughout the roster during the trip. The three freshmen in the rotation were quiet offensively at Stanford, but they combined for 41 points Saturday at Cal, where guard Both Gach scored 18. Gach's “just being assertive, not hesitating on his shots” was a good sign, teammate Sedrick Barefield said. His first couple of shots went in, and “I felt pretty good after that and just kept on shooting,” Gach said. The Utes hope to extend those good feelings at home. • The plus/minus statistic can be deceiving, but guard Parker Van Dyke and center Jayce Johnson made definite impacts against Cal. Utah outscored the Bears by 25 points in Van Dyke’s 27 minutes on the court and by 23 points in the 23 minutes that Johnson played. Johnson produced his best pair of games this season, totaling 17 points and 19 rebounds. 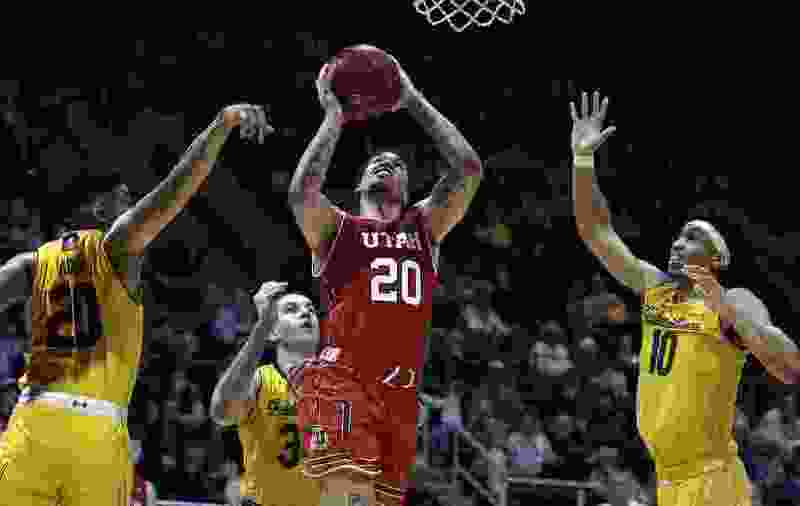 • Only three of the Utes' 82 points came from the free-throw line, partly because they missed six attempts. But at the other end of the court, the Utes succeeded in keeping Cal off the line. Drawing fouls is a big part of the Bears' game, but they got only 10 free throws Saturday, making five. • In the Pac-12′s scheduling rotation, the Utes drew only one game each vs. Cal and Stanford this season. That hurts. The consolation is those games were on the road, where wins are more valuable. Utah exploited those opportunities. Arizona State and Colorado lost at Stanford, but the Utes won there. Barefield. The senior guard totaled 39 points in two games, and his scoring always seemed to come at just the right time. The Utes clearly wouldn’t have beaten Stanford without him, and he was there when his team needed him against Cal. Van Dyke’s go-ahead layup in the last minute vs. Stanford. Barefield’s clutch scoring before and after this play tended to overshadow it, but Van Dyke’s drive in a half-court set was vital. It came via a rare, one-on-one sequence for him, as he beat his defender in the middle of the floor and finished deftly at the rim. A road sweep in the Bay Area for @UtahMBB.